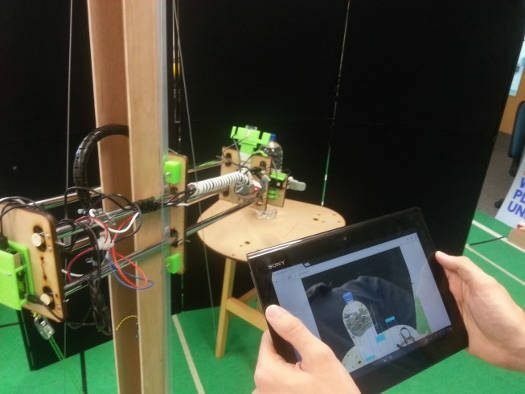 “The video shows first design of teleoperated mobile robotic manipulator produced in the Cheap Arm Project (CHAP). It costs less than $2,000, uses easily available parts and can be assembled by anybody with basic technical skills. The manipulator can reach objects from floor-level up to shelves at a height of 170cm using a new low-cost arm design. Teleoperation is done using a tablet, smartphone or browser. The cost could be further reduced by using different servomotors. The design and assembly instructions are made available on the open-source repository GitHub, with the hope that the community will build and improve the design. You can find more information on the Robohub website. The two masterminds behind this project are Dominic Cassidy and Guido Bugmann.